Gently fried sweet potatoes covered in a sugary coat. 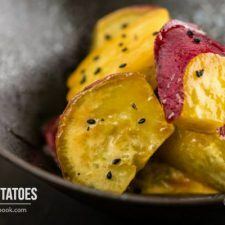 This Japanese-style Candied Sweet Potatoes (daigaku imo) recipe is a wonderful way to enjoy this fall vegetable. Fall is here and it’s my favorite season of the year. I love seeing the leaves turn into beautiful colors and make joyful crackling sounds as you step on them. And I love cooking on the cool days of autumn with seasonal vegetables like this dish of Candied Sweet Potatoes (Daigaku Imo, 大学芋). 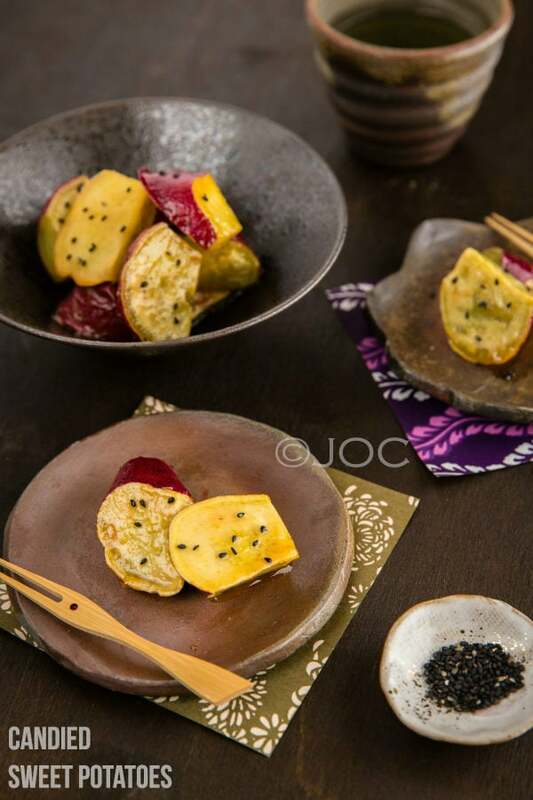 Japanese candied sweet potatoes (Daigaku Imo) covered in a sugary coat and garnished with black sesame seeds. I deeply miss Japan’s beautiful autumn season, when the rice is harvested and fresh, local vegetables are plentiful. We say, “Fall is the season for big appetites”. And it’s true. After a few months of steamy hot summer days, our appetite returns with the cooling weather, enthusiastic to cook and eat all those wonderful fresh ingredients. When I was in kindergarten, I remember I went to harvest sweet potatoes as part of a school excursion. We brought home sweet potatoes straight from the field, and my mom made these bright, candied sweet potatoes. The sweet potatoes were deep fried till crispy, glazed in a sweet sugary syrup and finished with a sprinkle of black sesame seeds. My dad and I love all kinds of potatoes, but this dish was one of our favorites. In Japanese, these candied sweet potatoes are called Daigaku Imo (大学芋), literally meaning “University Potatoes”. 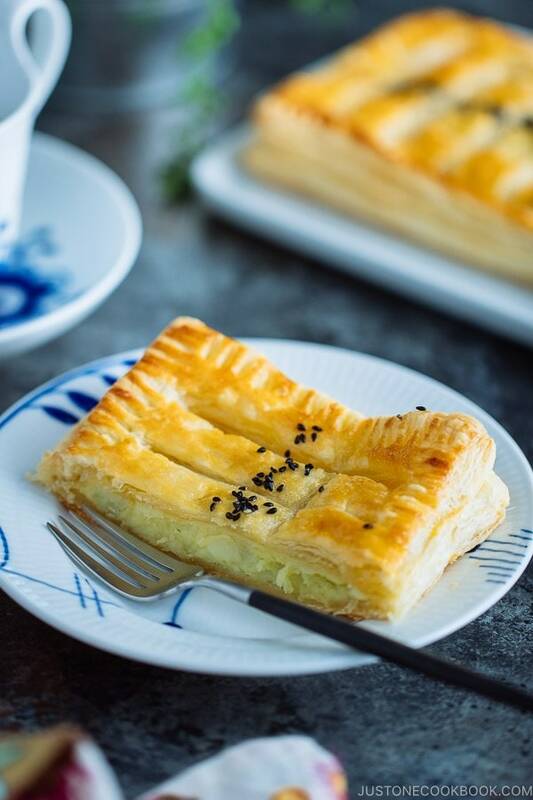 There are a few theories regarding the origin of the name (according to Japanese Wikipedia) but basically this dish was a popular snack at universities in Tokyo during early 1900’s. This Japanese snack is still popular today and can be found at many food stands and school festivals during the fall season. However, as I live outside of Japan, only way to enjoy this snack is to make my own at home. Following tradition, I’ve been deep frying the sweet potatoes for many years. However, this year my friend suggested a new method of both steaming and very shallow frying. To be honest, I was skeptical. There’s no way the candied sweet potatoes could taste better than the old-fashioned deep fried method, right? Well, I gave it a shot. And I was blown away. This candied sweet potatoes recipe is pretty close to the deep fried version – just as delicious and even easier to make. The sweet potatoes are crispy on the outside, and creamy soft in the middle. The sticky, sugary outer layer makes this a wonderful dessert or afternoon snack. I hope you enjoy this sweet and slightly savory daigaku imo. Thank you so much for reading! We don’t peel the skin of sweet potato so wash carefully. 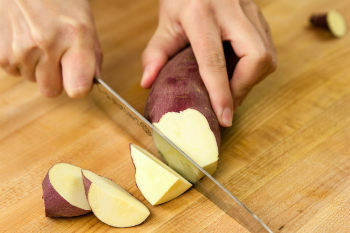 Cut diagonally while rotating the sweet potato a quarter between cuts. This Japanese cutting technique is called “Rangiri”. 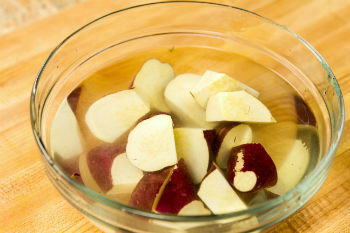 Soak in water for 15 minutes to remove starch. Change the water a few times. Wrap the frying pan’s lid with kitchen cloth. This is to prevent condensation on the lid dripping into sweet potatoes while cooking. Do not heat the frying pan yet. Add sugar, oil, soy sauce and rice vinegar in the pan and combine all together. Dry the sweet potatoes completely with paper towel and place in the pan. Cover with the lid and turn on the heat to medium. When you hear bubbling sound from the pan, turn the heat to low to medium-low, and set timer for 2 minutes. Open the lid and flip the sweet potatoes every 2-3 minute so that all sides will have nice golden brown color and get flavored. Depends on the size of sweet potatoes, the cooking time varies, cook for 8-10 minutes or until an inserted skewer goes through smoothly (I personally prefer it a bit tougher than completely soft texture). Now transfer to the serving plate/bowl and sprinkle black sesame seeds. * Vinegar helps the sugar from hardening when it cools down. I love fall food – sweet, warm, and bright! This looks like a very unique cooking method but I’m sure the results are worth the effort. It probably wouldn’t be a weeknight meal but great for the weekend when I have a bit more time. Thank you for sharing this recipe! It looks so delicious and such a healthy snack! I enjoyed your video, too! This looks good at anytime when you feel hungry for so munching. Nami, every time I visit your blog I find a taste treasure! Your version of sweet potatoes would be a neat “international” component to our traditional Thanksgiving dinner. (I like the color of the Japanese potato skins, too, and hope they’ll “translate” well with the regular ol’ orange-skinned variety here.) Rice vinegar sounds like the perfect counterpoint to the inherent sweetness of this dish, too. By the way, I never question your recipe “tweaks” because they’re so well-researched and tested! Quick question… if I can’t find black sesame seeds, do you think toasted “regular” seeds would work? oh my! this looks so good and I have just about everything, i’m so making this! 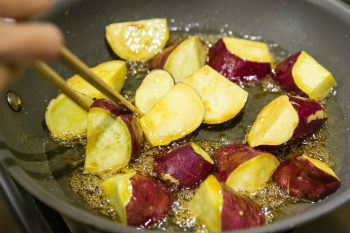 I love these Asian-style sweet potatoes, Nami! Such a simple yet great recipe. Hi Nami. Thanks for the tip on the vinegar. I tried making this before without the vinegar and the sugar coating became so hard. Now I know the secret. Yum, I love any sweet potato dishes and this sweet and savory dish sounds delicious. Thanks for sharing the great tip to avoid deep frying – can’t wait to try 🙂 Pinning. This looks like such a terrific recipe! Sweet potatoes make a great dessert, and this way of making them is new to me (quite different from the candied sweet potatoes that appear on many Thanksgiving tables). Really fun recipe – thanks so much. oh friend you outdid yourself on this one. I mean incredible doesn’t even begin to explain it. I cn just taste how sweet and chewy they are. Ahhh!! 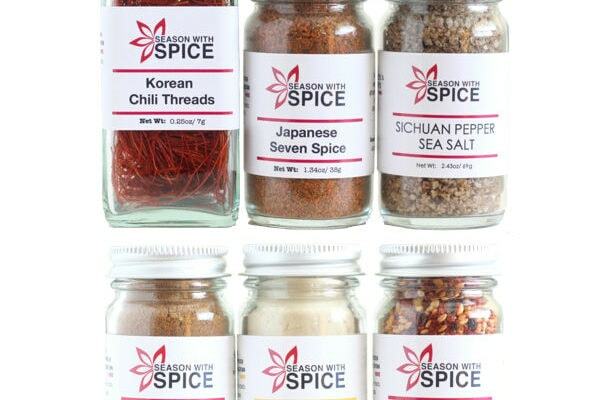 So delicious….and the clicks are just mind blowing……love love love it! I love sweet potatoes, these sound absolutely delicious! Yes!! Thanks for posting this recipe! This was one of my favorite snacks in Japan when I last visited and the colder weather is perfect for it. So good in bento! I never think to actually make them myself so thanks for the motivation and instructions. This is fantastic. We also have a sweet potato in the Philippines and combined with glazed sugar makes a similar snack like yours. Only difference is we don’t put black sesame seeds or the vinegar and soy sauce. But now you’ve made me curious and I want to try your version. Great video! Thanks for sharing, Nami. Enjoy the week. 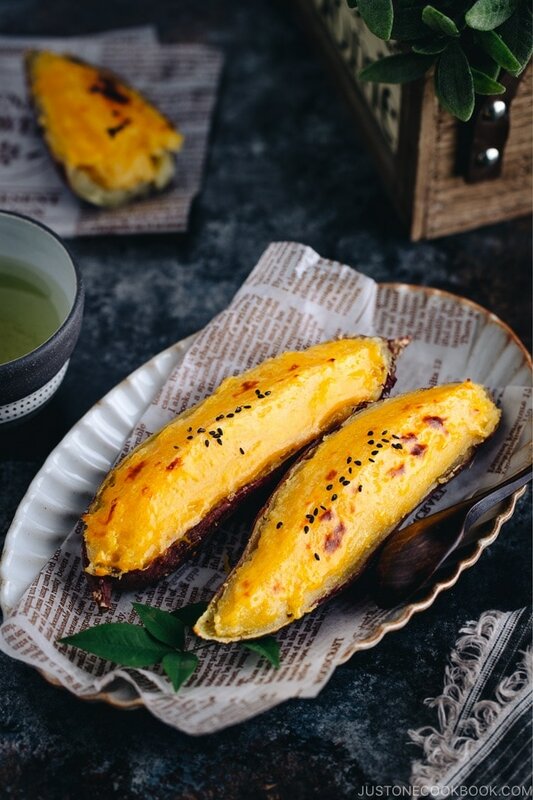 Dear Nami, this is the first time I heard about Japanese sweet potatoes, I do not think that I have seen them in stores around here or at my favorite Asian market but your pictures are so amazingly mouth-watering, I will ask for them and try to hunt them down so that I can make these for my family. This recipe certainly sounds too good not to try it out! Wow, I would love to try these as well… looks so delicious and definitely healthier than the deep fried version. I honesly can’t imagine how these taste like, ’cause I had sweet potatoes just once, in an Argentinian stew made with lentils. Your dishes always amaze me, Nami! For the first time this year I had a white sweet potato. It wasn’t calledJapanese but from the looks of yours I wonder if that’s what it actually was. I know it was very tasty. 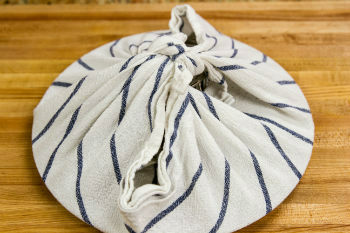 Your recipe sounds great and I like the method of wrapping the lid with a towel. I will have to try that. Thanks for sharing. I love the sound of these, would never have thought of trying it! Thank you for your feedback. I’m sorry yours didn’t turn out well. I want to check with you a few things that are important here. * size of pan – was yours bigger? Maybe not enough oil to cover while cooking? * heat – Maybe it was too strong? Please adjust to your gas/electric stove. * oil – Did you use vegetable oil? For example, olive oil is not appropriate for frying in this case. * rice vinegar – this is the key ingredient for not crystallizing the sugar. 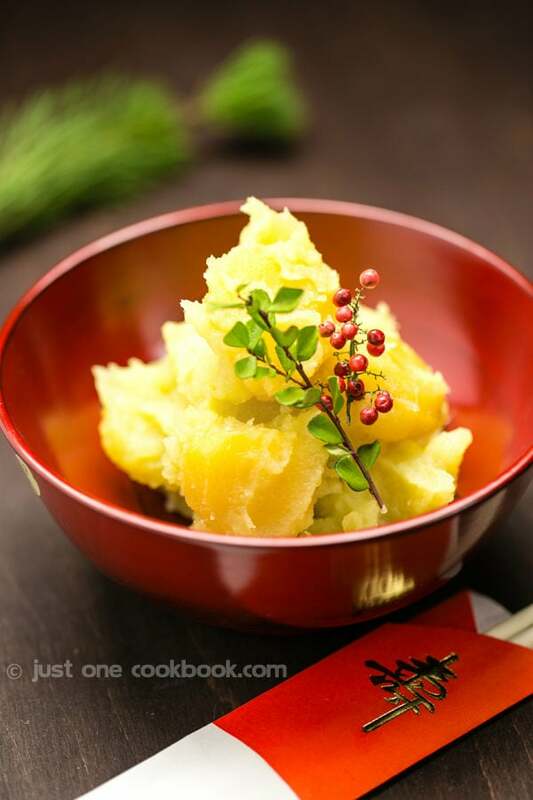 * sweet potatoes – Did you use Japanese ones? If not, the texture may be slightly different and you need to adjust the cook time. Also, make sure the sweet potato pieces were the same size and weren’t overlapping to maintain the same cooking time for all pieces. * the lid – Were you able to block the condensation from dripping to the pan from the lid? It’s important trick to keep make it crispy. You see how I cook through the video and step by step pictures so there is no secret. I’ve been making this for many times this year (we really love this recipe). I hope you can succeed next time. As I wasn’t in your kitchen, it’s very hard for me to pin point the reason(s) why it went wrong. But I REALLY hope to help you. thank you for your quick reply – the pan I used was a good size so no potato overlapped each other. I did do the lid cover with towel, used Japanese potatoes (my favorite) and while reading your reply I was thinking perhaps I did not turn the heat (electric) down enough. Perhaps I overcooked the potatoes and all of the sudden it turned very dark. Thanks for you reply and I will try again because I love those potatoes. You said since I am not in your kitchen – you can top over any time you want – haha! I will try again and let you know how it turns out. Hi Nancy! Okay, try cooking on lower heat and make sure to turn every 2-3 minutes (if you know inside is already cooked, you can turn up a little bit to make it crispy). I wish I could be in your kitchen and we can cook together! But we’ll be fighting over these when they are done. 😀 Haha Good luck!!! Your recipe for Candied Sweet Potatoes looks fantastic! I am always looking for new Thanksgiving dinner ideas and I think these potatoes will be a step up from the usual sweet potato casserole with marshmallows. Thank you. Hi Patricia! Hope you will enjoy this recipe as much as we do. I’ve never tried sweet potato casserole with marshmallows….. I bet my son (who loves marshmallows) will love it! 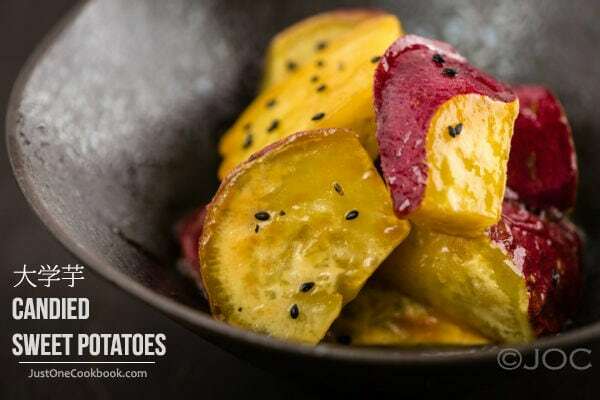 This simple and delicious recipe of sweet potatoes sounds very tempting. I have mostly had sweet potatoes as savory and this candied form is something I would love to try soon. When I saw the title I knew these potatoes would look like they came from Georgia. 🙂 Wow, they look fantastic! That make my mouth water. Like always thanks for the recipe. Thumbs up for a wonderful recipe and video! The recipe itself is very unique! I’m going to look for japanese sweet potatoes at the asian market near me. I really like that these are shallow fried and not deep fried. I’m scared of all the hot oil involved when deep frying, so this method looks easier (and healthier)! I have been loving my sweet potato too. Recently I made honey sweet potato bagels and miso sweet potato ice cream, yep I am addicted. I love candied potato, but never knew how to make it. I am gong to try it this weekend! 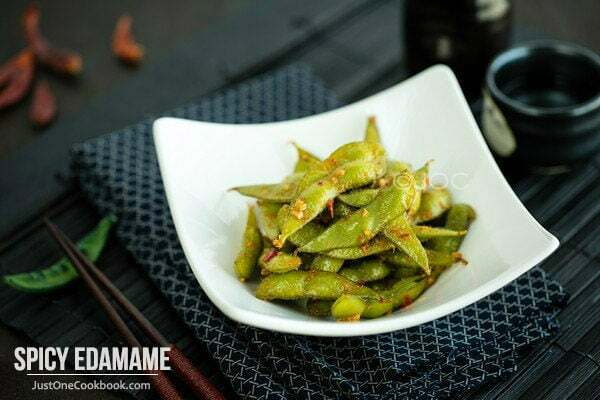 Nami – I’ve heard of these candied sweet potatoes but never tried them. They look incredibly good! I love the fall season too and it is my favorite season too! Very nice recipe, I never heard about candied sweet potatoes but it sounds very interesting and I would like to try. In Sweden potatoes are very popular and I can easily find sweet potatoes too… Let’s see if I will manage to try this next week, now that I am in maternity leave I have time to experiment new recipe… until the baby comes. I watched your video last night and enjoyed it. Love how you made these sweet potatoes, I can already imagine the taste and texture. It must me delicious! Instead of me pouring maple syrup or honey I can now make these. Awesome! Yummy Pics and great post, Nami! The candied sweet potatoes look delicious, I like the idea of pre-steaming and then frying, I will definitely try this out soon! I have never seen these but they look awesome. I am already a fan of sweet potatoes and I have a sweet tooth! Thank you for sharing! I loved the color of these candied sweet potatoes, very appealing. I never tried frying it though. 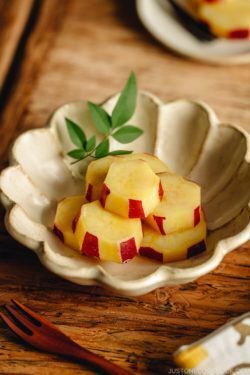 With the sugar glaze, it makes a yummy desert or a good evening snack with some tea. You can never go wrong with candied! I love the videos!! I liked the way you showed how you cut the potato in a special way. Japanese sweet potatoes are the absolute best tasting of all the sweet potatoes. I have gotten my daughter hooked on your website and she couldn’t believe how easy you make your recipes with the pictures. Thanks again for great recipes and your videos!! Thanks so much for introducing my blog to your daughter and I’m really glad to hear she thinks pictures are helpful. It takes extra time and I thought of giving up many many times… but feedback like this kept me going. 🙂 Thank you once again! What a great video! Short, sweet, great instructions, and visually pleasing! Definitely need to be watching more. 🙂 After seeing how these are made and the result, I can’t imagine why anyone would want to fry them. These potatoes look perfect so how could you beat perfection! 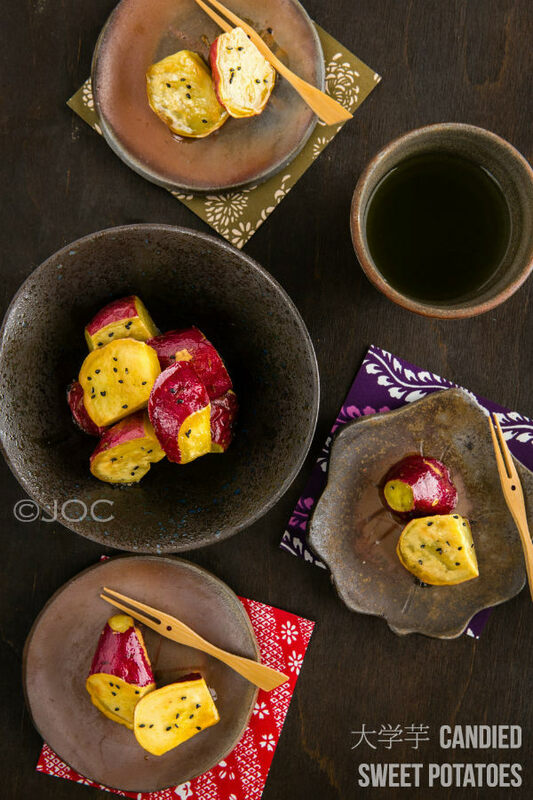 I discovered the Japanese Sweet potato last year and fell in love, so I look forward to making these. Gorgeous photos, and those sweet potatoes sound absolutely delicious. Beautiful, simple flavours, straight from Japan. Love the contrast of colours. As I live in a tropical country, what we cook and eat are not exactly seasonal other than food associated with special occasions. Another gorgeous dish from you! Looks spectacular! Oh, and that’s so awesome for kindergarden excursion to go harvest sweet potatoes! Oh, Nami this looks so delicious. For a moment I thought they were nigella seeds, but love the use of black sesame seeds in it. The pictures are so pretty, the colors work so well together. Oh those look just so divine, Nami. I adore sweet potato, but we mainly get the orange ones here – not nearly as nice – too squidgy! But our local store gets them now, so I’ll definitely try this. The video is super-helpful! Loved the concept of candied potatoes: never had anything like this before! And also it is so easy! Just mentioned in my last post that fall is my favorite season. I can imagine how beautiful fall must be in Japan. My husband is a huge sweet potato fan and will be delighted with this recipe. I love candied sweet potatoes or Daigaku Imo! They look so pretty with the black sesame seeds. Thank you for taking the time to post step-by-step photos, I really appreciate it! Oh my goodness I can’t wait to try this method. Sweet Potatoes are my favorite veggie and I can eat them just microwaved and plain. However, after seeing these I want this to be my new favorite way of cooking them. This is the first time I’ve seen a Japanese sweet potato and I hope I can find them at our teeny tiny Asian market. Nami, good job on the beautifully made video instruction! I adore yam and the sweeter the better! This is probably going to be my next dessert idea for a party. Thanks for sharing the recipe! I love sweet potatoes and I say we live to learn new things! Socrates a very big Greek philosopher said, I grow old and i always learn. I love your potatoes Nami! Oooh, delicious! I love sweet potatoes — these look fantastic! Wow! I love sweet potatoes just baked in the oven, but this looks like a fantastic way to enjoy them! I love sweet potatos and these look absolutely beautiful Nami!! We love sweet potatoes and up until I read your post, I thought I had seen them prepared every possible way. This is such a unique method and I’m sure they are amazing! What an original snack (or dessert?). The photographs are particularly beautiful and the video so impressive! How do you manage to produce such time consuming posts in such short intervals! I guess I will never know… You are amazing! They do look amazing! Have to try them! but never try the carmel/candied version…..
btw, i love the color of your unpeeled sweet potato, the skin add some fibers intake too! My experience with sweet potatoes is pretty limited… Glad to see this recipe, I am going to try this out soon. I just bought a large sweet potato and wanted to try something different. This is such a great new recipe. Mm, this looks really nice! I wonder, do you think Korea has a similar recipe? I had something which seemed really familiar to this in a Korean restaurant one time and loved it! That’s so true, fall is when our appetites grow at the anticipation of the rich and warming foods of the cooler months ahead! Love this and your video. The color of these potatoes is beautiful! And these sound delicious. 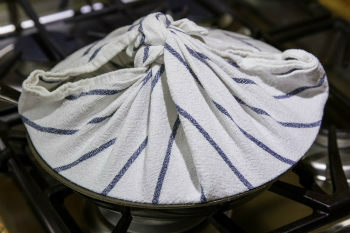 I like your method of covering the lid with a dish towel to prevent steam from spattering in the oil. Will have to try sometime! Can the candied sweet potatoes be eaten cold? I have a Thanksgiving dinner w/ friends and wanted to make this dish, but wasn’t sure if it’s good to eat cold. Hi Nami…I just made these today and they were amazing!! Wish I had taken a pic to put on instagram and tag you but I just ate them all in one go. they were that yummy!! I’ll take a pic next time 🙂 Also, I used olive oil (light) and they turned out fine…I read later in one of the comments you said not to use olive oil (oops!) but no problem! Hi! 🙂 – Do you eat it as snack or as side dish? Oh this is soo gorgeous .. I love Sweet potato ,steamed . Sugar glazed and toasted on a pan sounds soo warm and delectable…. 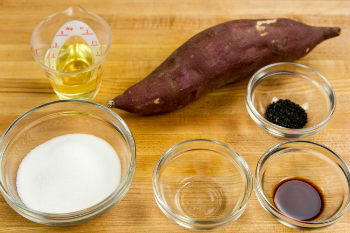 What is the difference between an American and a Japanese sweet potato please… Thank you in advance for your reply. Hi Faleen! First of all, it tastes a bit different. Japanese sweet potatoes are much sweeter (so it is used in many dessert recipes). 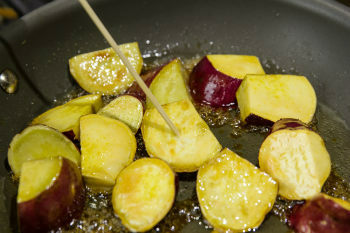 The color of the sweet potato is yellow inside and purple outside. The texture is harder when it’s cooked (doesn’t get so mushy). Maybe the following links I found might help? Also, is rice vinegar the same as sushi seasoning or are they slightly different? This is hands down the best daigaku imo recipe I’ve come across! 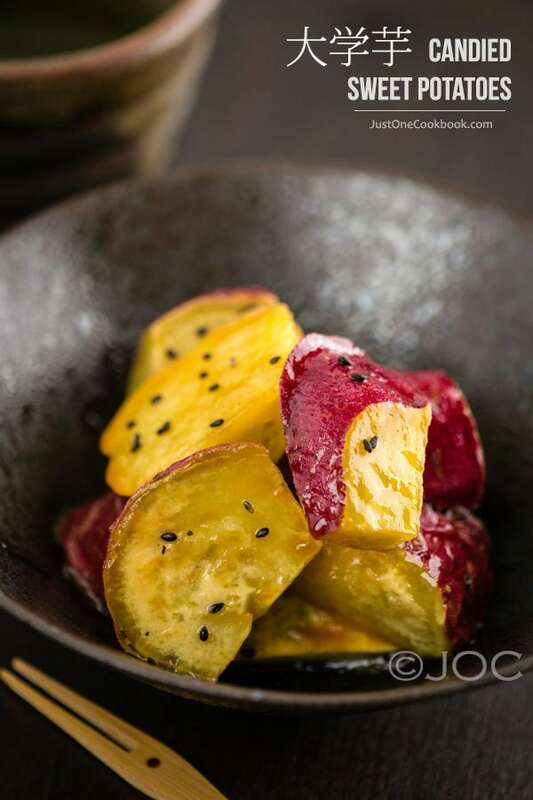 Hello, can I use purple japanese sweet potato for this recipe? I tried this several times for my college friends back than in Japan, and it was sooo awesome. Thank you Nami san! I tried it without soaking the sweet potatos in water and it still came out just delicious!! I also put the sweet potatos in the microwave for 2 minutes so that it somewhat cooked before putting it on the pan. My candied sweet potatos did not brown evenly. What would you suggest? Thank you!! I made these tonight as a side dish with dinner and it was absolutely amazing! You could definitely eat it as a dessert but it was a great accompaniment to the teriyaki chicken (also your recipe), rice, and swiss chard we ate as well. I loved the texture, they were crisp on the outside and warm and fluffy on the inside and the sauce carmalized on the surface for the perfect bite! Thanks Nami for sharing this recipe. Every recipe I have tried of yours ends up being spectacular! Hi Erica! I’m so happy to hear you tried this recipe (and teriyaki chicken recipe)!! I’m glad yours came out well and thanks so much for your kind feedback! Hi Lucia! So happy to hear that. I LOVE Japanese sweet potatoes… I can’t get enough. 😀 . I will remember, fall is coming and it’s sweet potato season! YUM. Thanks for writing! Hi Nami, can I use this recipe to make candied sweet pumpkin? Hi Emma! Thank you for your kind words! I’m so happy to hear you enjoyed this recipe! I had done this recipe once but with lemon juice instead of rice vinegar. I can’t remember where I had found the lemon juice. Anyway, I had not liked it then, but tried your way and it was super nice and quick to make. Thanks tons for sharing! I found this recipe when wondering what “College Potato” KitKat Flavor was all about and made them the other night. They are in our rotation as I immediately craved them when we licked the bowl clean. I am so excited for dinner tonight so I can make them again!